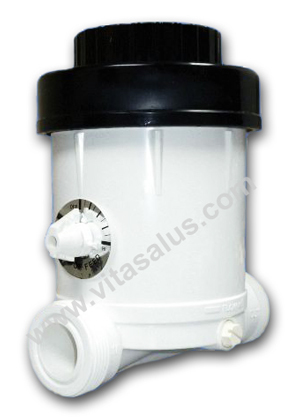 Vitasalus Inline Chlorinator - Chlorine Feeder System. How does the Inline Chlorinator work? Order by for our special Sale Price. The Vitasalus Inline Chlorinator™ is an advanced chlorine feeder system designed for ease of use, to help disinfect and/or control iron, iron bacteria, sulfur, hydrogen sulfide, and rotten-egg odor, within well and other source water. As the source water passes through the Inline Chlorinator, the chlorine pellets are dissolved based on the simple pre-set feed rate, allowing for disinfection, oxidization and precipitation to take place. If the Inline Chlorinator is being used for a home it will require a carbon based filter to remove the chlorine back out of the water before it flows throughout the home. We recommend the complete PureMaster™ V-750. The Inline Chlorinator is installed directly inline with the plumbing pipes for easy installation and maintenance. 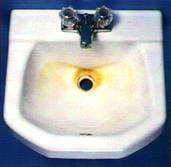 Do you want to eliminate these iron and sulfur related conditions in your water? How may we further help you with the Inline Chlorinator? You may also want to consider the following systems which would install in-line, just after the Inline Chlorinator system, unless otherwise noted. After adding the Inline Chlorinator to your shopping cart, you may click the "Continue Shopping" or "Back" button to return here so that you may make your next selection below of the complete PureMaster™ V-750T, FluorideMaster™, HardnessMaster™, or the Combo Package. HardnessMaster™: electronic water conditioner which provides an effective and healthy alternative to water softeners and de-scalers. Set it and forget it. NO more salt! Installs in-line before the Inline Chlorinator. Pure Master™ V-Series™ Whole House Water Filtration Systems: highly-specialized system designed to remove up to 99.9% chlorine, VOCs, THMs, atrazine, benzene, pesticides, insecticides, tastes, odors and hundreds of other potential contaminants and harmful chemicals from the water entering your home. 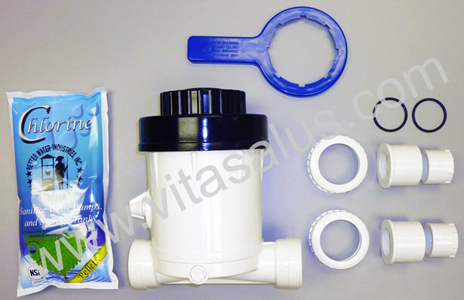 Order by for Sale Price.
. Union adapters up to 1-1/2"
How does the Inline Chlorinator system work? The Inline Chlorinator is an advanced chlorine feeder system designed for ease of use, to help disinfect and/or control iron, iron bacteria, sulfur, hydrogen sulfide, and rotten-egg odor, within well and other source water. 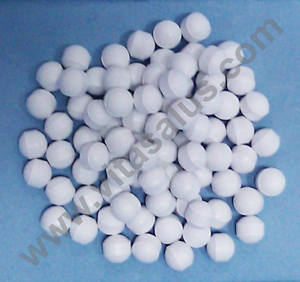 As the source water passes through the Inline Chlorinator, the chlorine pellets are dissolved based on the pre-set feed rate, allowing for disinfection, oxidization and precipitation to take place. If the Inline Chlorinator is being used for a home it will require a carbon based filter to remove the chlorine back out of the water before it flows throughout the home. We recommend one of our complete PureMaster™ V-Series systems to filter back out the chlorine as well as many other contaminants that may be present in your source water, PureMaster™ V-Series Whole House Water Filtration Systems. Purpose/Function: Designed to help disinfect and/or control iron, iron bacteria, sulfur, hydrogen sulfide, and rotten-egg odor, within well and other source water. Time between Chlorine Refills: Add Chlorine Pellets (i.e., Calcium HypoChlorite Pellets) every 2-3 months, depending upon actual water usage.